Ever since I was a child, I have been fascinated by lizards and other reptiles, but growing up in the Northeast my sightings were pretty rare. However, in Florida we are blessed (and sometimes cursed when you think of the invasive species) with an abundance of lizards in our backyards that can be an amazing part of your landscape. 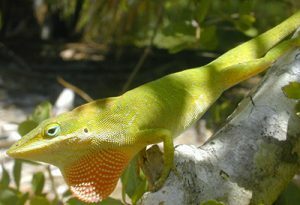 I go into more detail on the different species of lizards in Florida in the blog post, Leaping Lizards, found at http://blogs.ifas.ufl.edu/clayco/2017/04/24/leaping-lizards/, but in Clay County you are likely to see Anoles, both the native Green and the invasive brown, blue-tailed and other skinks, and even some non-native geckos. However, their distribution can have much to do with your landscaping. Like most wildlife, lizards need four main things for optimum survival: Food, Water, Shelter, and Space. For food, most lizards are insectivores and will need a good supply of insects to keep them well fed. To manage this, try to utilize pesticides only when necessary and use a selective product to only treat the pest, leaving the non-target insects to thrive and provide meals for your reptiles. The lizards will return the favor by controlling many of your pests for you. Water can also be provided for lizards by natural sources nearby, small dishes to catch rain or irrigation, or man-made ponds or water supplies. Shelter for lizards is often as simple as having fairly dense vegetation with vertical layers, meaning you will have a variety of low, medium, and high growing plants in the landscape. This will likely provide all the cover a lizard would like but some will also frequent brush piles, crevices in stones, or in my case, the soffit in my porches. This shelter is essential to allow the reptiles to get away from predators or cool off to maintain their body temperatures. Finally, too much human traffic and movement can stress animals so if possible, just leave the critters alone with their own space to live. If you have any further questions about landscaping for wildlife in Florida, see http://edis.ifas.ufl.edu/uw175 or contact your local UF/IFAS Extension County Office for more information.